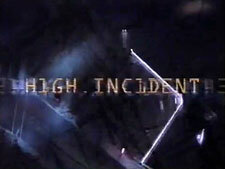 High Incident: Mystery and Suspense on Television. This ensemble crime drama focused on the everyday stories of El Camino Police Department, located in a fictional neighborhood of Los Angeles. Created (in part) by Steven Spielberg and produced by his company DreamWorks Television, it premiered as a mid-season replacement but never gained a sizeable audience and was canceled by ABC after its second season.